Received June 9, 2018; Revised August 6, 2018; Accepted August 7, 2018. The aim of this study is to analyze postoperative outcomes for carotid endarterectomy (CEA) in addition to the preoperative clinical characteristics related to selective shunting based on dual monitoring with stump pressure (SP) and electroencephalography (EEG). We retrospectively reviewed medical records of 70 patients who underwent CEA from March 2010 to December 2017. CEA was performed under general anesthesia and selective shunting was done if the SP was lower than 35 mmHg regardless of EEG or if intraoperative EEG showed any changes different from preoperative one regardless of SP. There was no postoperative 30-day adjusted mortality or adverse cardiac events. Three patients (4.3%) had postoperative minor stroke finally reaching pre-operative neurologic status at the time of discharge. Twenty-six patients (37.1%) used shunting and severe contralateral internal carotid stenosis or occlusion was related to shunting (P<0.010). There were larger number of symptomatic patients in shunt group in spite of no statistical significance (P=0.116). Perioperative stroke rate was 4.3% for CEA under general anesthesia based on dual intraoperative monitoring with SP and EEG. There was no 30-day adjusted mortality and adverse cardiac event. Severe stenosis or occlusion of contralateral internal carotid artery is related to shunting (P<0.010). Randomized controlled studies reported that carotid endarterectomy (CEA) has significantly reduces the subsequent stroke for symptomatic patients [1,2] and shows beneficial effect on stroke prevention for asymptomatic ones [3,4]. In order for CEA to be an effectively preventive procedure, however, intraoperative cerebral protection from hypo-perfusion and early detection of cerebral ischemia using proper monitoring methods are crucial to avoid perioperative stroke. Although intraoperative temporary shunting is the most commonly used for cerebral protection, it has widely been known that shunting has its own complications, such as dissection, distal embolization, or difficult exposure of distal end of highly located plaque [5,6]. We authors have chosen selective shunting rather than routine shunting and reported the postoperative results of CEA based on intraoperative dual monitoring using electroencephalography (EEG) and stump pressure (SP) . The purpose of this study is to analyze postoperative morbidities and mortalities based on dual monitoring in addition to preoperative clinical factors related to shunt usage. We retrospectively reviewed the medical records of seventy patients who underwent CEA under general anesthesia from March 2010 to December 2017. The study protocol was approved by the Institutional Review Board of Jeju National University Hospital (IRB no. JEJUNUH 2018-06-006). This study was exempted from written informed consent due to retrospective analysis based on medical records by Institutional Review Board. Taking medical history, neurophysical examination, laboratory studies, and carotid duplex scanning were done pre-operatively. Indications for CEA were based on the degree of stenosis on carotid duplex which was more severe than moderate stenosis (peak systolic velocity faster than 170 cm/sec, 60%–79% stenosis) for symptomatic patients or severe stenosis (peak systolic velocity faster than 240 cm/ sec, 80%–99% stenosis) for asymptomatic ones. Preoperative waking EEG was performed for baseline study in order to detect any intraoperative changes on EEG. Antiplatelet agents which were used before operation maintained until the operation day not to aggravate neurologic status. We started EEG monitoring before induction of general anesthesia in the operation room and neurologist kept monitoring to detect any changes in EEG until the end of operation (Fig. 1). Under general anesthesia and cervical incision, common, external, and internal carotid arteries were exposed after ligation and division of common facial vein and other branches of internal jugular vein. After arterial clamping was applied to common and external carotid artery, 23-gauge needle was inserted to proximal internal carotid artery in order to measure SP which reflected arterial flow through Circle of Willis during clamping for arteriotomy (Fig. 2). While we measured SP, we asked anesthesiologist to keep systemic blood pressure being stable which was similar to the average pressure during admission period. Intraoperative temporary shunt (Pruitt F3-Polyurethane Carotid Shunt with T-port [outlying]; LeMaitre Vascular, Inc., Burlington, VT, USA) was inserted based on the dual monitoring using EEG and SP. Regardless of SP, shunting was performed when there were any changes of EEG including slowing (decrease in frequency), flattening, or asymmetry (any changes in amplitude or in shape of waves) which was different from preoperative baseline EEG. Shunting was also used if SP was lower than 35 mmHg even though there were no significant changes on intraoperative EEG. After we completed excision of atheromatous plaque by conventional endarterectomy technique (not eversion endarterectomy), we confirmed transition zone which was located from excised plaque to the normal intima, arteriotomy was repaired with bovine pericardial patch (Edwards Lifesciences, Washington, D.C., USA). Tacking suture was done selectively when transition zone was not definitely exposed because of risk of dissection or embolization. Operation wound was closed without insertion of drainage catheter after completion of bleeding control. Postoperatively we focused on the any changes in neurologic status to detect signs of stroke and on the control of blood pressure to prevent hyper-perfusion syndrome. We did routine neurologic examination every two hours on the operation day in the intensive care unit. If the patient showed any changes in neurologic examination or level of consciousness, we consulted neurologist immediately and checked radiologic imaging based on the patient’s status. We controlled blood pressure with bolus injection or continuous infusion of intravenous beta blocker so that systolic blood pressure should be maintained within the range from 110 mmHg to 140 mmHg. Initial postoperative imaging was done at the third month after operation using carotid duplex scanning and routine follow-up was performed at six-month interval by neurologist with carotid duplex. Chi square test IBM SPSS Statistics ver. 24.0 software (IBM Co., Armonk, NY, USA) was used for comparing clamp group with shunt group. Fifty-two men and 18 women were included and their mean age was 71.4 years (range, 51–86 years). Forty patients (57.1%) were symptomatic and all of them underwent CEA within 2 weeks from the onset of stroke symptoms. Asymptomatic patients (n=30) underwent CEA electively due to aggravated carotid stenosis on follow-up carotid duplex scanning or severe carotid stenosis detected by health checkup program. The patients who had deteriorated carotid stenosis on follow-up had history of regular visit of department of neurology due to various neurologic symptoms including headache, amaurosis fugax, or remote stroke. Preoperative characteristics are presented in Table 1. There were two cases of postoperative morbidities. One was postoperative bleeding with hematoma which required reoperation and the other was hypoglossal nerve injury presented as tongue deviation. Although the patients who had ischemic heart diseases were included, there were no adverse cardiac events postoperatively. There were three patients (4.3%) of minor stroke who showed any changes on neurologic examinations postoperatively, such as aggravated preoperative symptoms or newly developed neurologic symptoms. All of the postoperative stroke patients used temporary shunt because of low SP and they did not show intraoperative changes in EEG, such as asymmetry, slowing, or flattening. Two of them had severe stenosis of contralateral internal carotid and they were confirmed as border zone infarct on diffusion magnetic resonance imaging. All of the postoperative stroke patients recovered reaching preoperative neurologic status at the time of discharge. When operative mortality was defined as death within 30 days from operation or death during the same period of admission for operation, there was no operative mortality. When we divide the included patients into ‘shunt group’ (the patients who used intraoperative temporary shunting) and ‘clamp group’ (the patients who underwent CEA without shunting), the characteristics of each group are presented in Table 2. Indications of shunting were low SP in 19 patients regardless of EEG, low SP combined with changes in EEG in 3, and changes in EEG regardless of SP in 4. Shunt group was 26 (37.1%) and it included 18 symptomatic patients. Mean SP of clamp group was 46.7 mmHg and that of shunt group 28.7. The patients who had severe stenosis of contralateral internal carotid artery (ICA) on preoperative carotid duplex scan were 11 (42.3%) in shunt group and only 1 (2.3%) in clamp group (P<0.010). Moreover, five ICA occlusion cases (no forward flow detected on carotid duplex) were included in shunt group. There were larger number of symptomatic patients in shunt group in spite of no statistical significance (P=0.116). CEA has been established as a standard procedure for stenosis of ICA both for symptomatic and asymptomatic patients . Although it has been reported that mean perioperative stroke rate is from 2% to 6% recently regardless of presence of symptoms , Biller et al. stated that the perioperative stroke/death rate should be less than 3% to realize the benefit of CEA for asymptomatic carotid stenosis patients. We presented 4.3% of perioperative stroke without any 30-day adjusted death. All of the perioperative stroke cases were minor stroke and there were no perioperative stroke for asymptomatic carotid stenosis patients. Although this study is single institution’s experiences with limited number of cases, postoperative results might be regarded as acceptable and beneficial for symptomatic and asymptomatic patients compared with previously reported results. It is widely known that there is no established gold standard for intraoperative monitoring for CEA and choice of intraoperative monitoring methods is closely related to type of anesthesia. We have chosen general anesthesia because of high reluctance to awareness of the patients and maintenance of stable blood pressure and ventilation by anesthesiologist under close monitoring. It was reported that choice of anesthesia depends on the surgeon’s preferences and team’s experiences because type of anesthesia is irrelevant to postoperative outcome even though CEA under general anesthesia has higher odds of postoperative MI and hemodynamic instabilities . One of the reports said that both SP and EEG had poor sensitivity and intraoperative monitoring of awake patients under regional anesthesia is the most sensitive method for detecting cerebral ischemia . According to our results, all of the patients using temporary shunting due to the changes in EEG who’s SP were higher than 35 mmHg showed reversal of EEG changes after shunting. On the basis of these findings, EEG is thought to be complementary to SP rather than that such observed EEG changes were false-positive. If our institution should maintain the strategy for CEA under general anesthesia due to patients’ satisfaction and safety, instant monitoring with SP combined with continuous one with EEG is considered reasonable. Indications of selective shunting of this study are solely dependent on the intraoperative monitoring and any pre-operative relevant or predictive characteristics for shunt usage are not well known. If CEA patients have high carotid bifurcation, high distal end of plaque, long stenosis, or short neck, adverse outcome can be expected due to difficult exposure, incomplete removal of atheromatous plaque, distal embolization, or subsequent dissection of ICA. If, moreover, shunt is inserted for such cases, more perivascular dissection, longer operation time, and increased chance of bleeding or cranial nerve injury could occur in addition to complex surgical procedure due to shunt placement and removal. It is helpful for both neurologists and vascular surgeons to choose proper carotid revascularization methods or the operative techniques for wider and higher exposure if there are preoperative factors predicting or being related to shunt usage for patients expecting adverse outcome technically. From these perspectives, analysis was performed for preoperative clinical or laboratory characteristics between shunt group and clamp group. Although significantly large number of patients having contralateral steno-occlusion were included in shunt group, clinical significance of contralateral ICA steno-occlusion is still controversial because it was considered as one of the risk factor for perioperative stroke  although Sef et al. documented that patients with contralateral ICA occlusion showed no impact on the CEA outcome in spite of significantly lower SP. All of the patients having contralateral occlusion did not present any postoperative neurologic deficit despite that all of them needed shunting. If patients have any conditions related to difficult exposure combined with contralateral occlusion or severe stenosis of ICA, aggressive techniques for adequate exposure, such as mandibular subluxation or dislocation might be considered before operation . Although there have been debates on routine shunting, selective shunting, or routine non-use of shunt, there is no evidence that one strategy is superior to others. It can be debatable whether selective shunting based on dual monitoring strategy using EEG and SP should be maintained or not because this study is not a prospective randomized trial. EEG requires special devices, specialists, extra time to install, and corresponding cost and it has well-known shortcomings including low sensitivity for recent stroke patients, time gap between cerebral ischemia and presentation of changes in EEG under general anesthesia, or low detection rate of subcortical ischemia [16,17]. We have tried other monitoring methods recently and accurate intraoperative monitoring for CEA using transcranial doppler or cerebral oximetry in addition to SP and EEG. Randomized study for finding accurate and efficient monitoring with larger volume of patients should be performed in the future. In conclusion, perioperative stroke rate was 4.3% for CEA under general anesthesia based on dual intraoperative monitoring with SP and EEG and there was no 30-day adjusted mortality and adverse cardiac event. Contralateral severe stenosis or occlusion of ICA is related to shunting (P<0.010). Fig. 1. Intraoperative monitoring of electroencephalography started before induction of general anesthesia. Fig. 2. 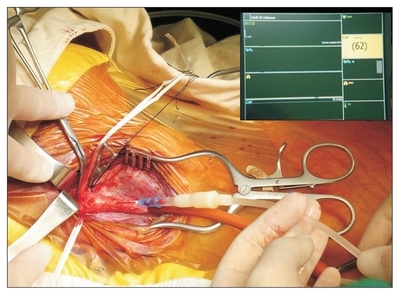 Intraoperative measuring of stump pressure was presented in the monitor. Values are presented as number (%) or number only. Number of hypertension, diabetes, dyslipidemia, and ischemic heart diseases represents those of cases because there were the patients who had more than two diseases. Values are presented as number (%) or mean only. DM, diabetes mellitus; SP, stump pressure; ICA, internal carotid artery. It means stenosis of contralateral ICA measured on carotid duplex scan. Five patients having contra-lateral occlusion were included. Barnett, HJM, Taylor, DW, Haynes, RB, Sackett, DL, Peerless, SJ, and North American Symptomatic Carotid endarterectomy Trial Collaborators (1991). Beneficial effect of carotid endarterectomy in symptomatic patients with high-grade carotid stenosis. N Eng J Med. 325, 445-453. Barnett, HJ, Taylor, W, Eliasziw, M, Fox, AJ, Ferguson, GG, and Haynes, RB (1998). Benefit of carotid endarterectomy in patients with symptomatic moderate or severe stenosis. North American Symptomatic Carotid Endarterectomy Trial Collaborators. N Eng J Med. 339, 1415-1425. Executive Committee for Asymptomatic Carotid Atherosclerosis Study (1995). Endarterectomy for asymptomatic carotid artery stenosis. JAMA. 273, 1421-1428. Halliday, A, Mansfield, A, Marro, J, Peto, C, Peto, R, and Potter, J (2004). Prevention of disabling and fatal strokes by successful carotid endarterectomy in patients without recent neurological symptoms: randomised controlled trial. Lancet. 363, 1491-1502. Aburahma, AF, Mousa, AY, and Stone, PA (2011). Shunting during carotid endarterectomy. J Vasc Surg. 54, 1502-1510. Aburahma, AF, Stone, PA, Hass, SM, Dean, LS, Habib, J, and Keiffer, T (2010). Prospective randomized trial of routine versus selective shunting in carotid endarterectomy based on stump pressure. J Vasc Surg. 51, 1133-1138. Chang, JW, Kim, SW, Lee, S, Lee, J, and Ku, MJ (2017). Dual monitoring with stump pressure and electroencephalography during carotid endarterectomy. Korean J Throac Cardiovasc Surg. 50, 94-98. Kang, JL, Chung, TK, Lancaster, RT, Lamuraglia, GM, Conrad, MF, and Cambria, RP (2009). Outcomes after carotid endarterectomy: is there a high-risk population? A National Surgical Quality Improvement Program report. J Vasc Surg. 49, 331-339. Bennett, KM, Scarborough, JE, and Shortell, CK (2015). Predictors of 30-day postoperative stroke or death after carotid endarterectomy using the 2012 carotid endarterectomy-targeted American College of Surgeons National Surgical Quality Improvement Program database. J Vasc Surg. 61, 103-111. Biller, J, Feinberg, WM, Castaldo, JE, Whittemore, AD, Harbaugh, RE, and Dempsey, RJ (1998). Guidelines for carotid endarterectomy: a statement for healthcare professionals from a special writing group of the Stroke council, American Heart Association. Circulation. 97, 501-509. Dakour Aridi, H, Paracha, N, Nejim, B, Locham, S, and Malas, MB (2018). Anesthetic type and hospital outcomes after carotid endarterectomy from the Vascular Quality Initiative database. J Vasc Surg. 67, 1419-1428. Hans, SS, and Jareunpoon, O (2007). Prospective evaluation of electroencephalography, carotid artery stump pressure, and neurologic changes during 314 consecutive carotid endarterectomies performed in awake patients. J Vasc Surg. 45, 511-515. Sef, D, Skoplijanac-Macina, A, Milosevic, M, Skrtic, A, and Vidjak, V (2018). Cerebral neuro-monitoring during carotid endarterectomy and impact of contralateral internal carotid occlusion. J Stroke Cerebrovasc Dis. 27, 1395-1402. Simonian, GT, Pappas, PJ, Padberg, FT, Samit, A, Silva, MB, and Jamil, Z (1999). Mandibular subluxation for distal internal carotid exposure: technical considerations. J Vasc Surg. 30, 1116-1120. Ackerstaff, RG, and van de Vlasakker, CJ (1998). Monitoring of brain function during carotid endarterectomy: an analysis of contemporary methods. J Cardiothorac Vasc Anesth. 12, 341-347. Howell, SJ (2007). Carotid endarterectomy. Br J Anaesth. 99, 119-131.